The Gezira Scheme is Sudan's oldest and largest gravity irrigation system. The scheme has played an important role in the economic development of the country, and is a major source of foreign exchange. The farming system of the Gezira Scheme is dominated by crop production. The main crops grown are sorghum, wheat, groundnut and the oilseed crop sesame. Sunflower (Helianthus annuus L.) is an important oil crop in the world and a new edible oil crop in Sudan. Knowledge of the effects of irrigation scheduling on sunflower production and water productivity under water stress conditions is becoming increasingly important. Irrigation scheduling is particularly important since many field crops are more sensitive to water deficit at specific phonological stages. Sunflower has several growth stages: emergence, vegetative, reproductive, flowering, seed formation and maturity. Water stress in each stage results in reduction in seed yield and oil content. The treatments in the test plots, which were conducted to study the effect of water stress at different growth stages, showed that sunflower was significantly affected by water stress that occurred in the sensitive flowering and seed formation stages. Highest seed yield was obtained when water stress was avoided during these stages. The AquaCrop model was used to simulate the seed yield and water productivity. The model was able to precisely simulate seed yield, but overestimated water productivity under different irrigation treatments. Eman R.A. Elsheikh graduated from Gezira University, Faculty of Agricultural Sciences in 2000. She works in the Agricultural Research Corporation, Land and water Research Centre, WadMedani since 2003. She started her master programme in 2005 in the Water Management and Irrigation Institute, University of Gezira, and completed her master study in 2007.She participated in the international short course on Integrated Watershed Management, Bangkok, Thailand in 2008. In January 2010 she worked at the Forestry Research Centre in Khartoum. In 2009 she attended the Watershed and River Basin Management short course at UNESCO-IHE Institute for Water Education. During this course she met Professor Bart Schultz for her PhD proposal, and got a full scholarship in January 2011 from the Netherlands Fellowship Programme (NFP) for her PhD study at UNESCO-IHE, Department of Water Science and Engineering. 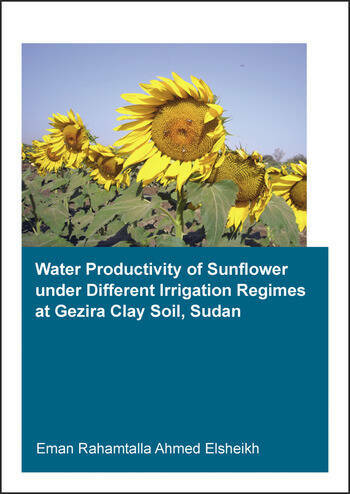 Her PhD research is on Water Productivity for Sunflower (Helianthus annuus L) under Gezira clay conditions, Sudan. In 2014 she gained another grant for research from the International Foundation for Sciences (IFS). She attended two annual PhD seminars during her PhD study.